The planeterrella II was born in 2011. The growing success of Planeterrella I led to some changes. Indeed, the initial gauge of 30 people is not enough for more than a hundred people coming now alltogeher to Planeterrella exhibitions. Therefore, we added a camera. In the picture, it is a webcam that has not worked well. Since then, the theatre Hexagone de Meylan (http://www.theatre-hexagone.eu/scene-nationale/index.php), through its action "Rencontres I" funded a color CCD camera. We chose a camera widely used in amateur astronomy, an Imaging Source DFK 31BU03H. Thus, the image can be projected on a screen. This poses some problems because the light of the screen must not blind experience, but working on a few solutions, we come to present the experience to many people. And it’s very impressive to see a giant auroral oval! Another improvement involves the vaccum chamber, now made ​​of glass in an ovoid shape. Thus, we have a perfect view from above as from the side. 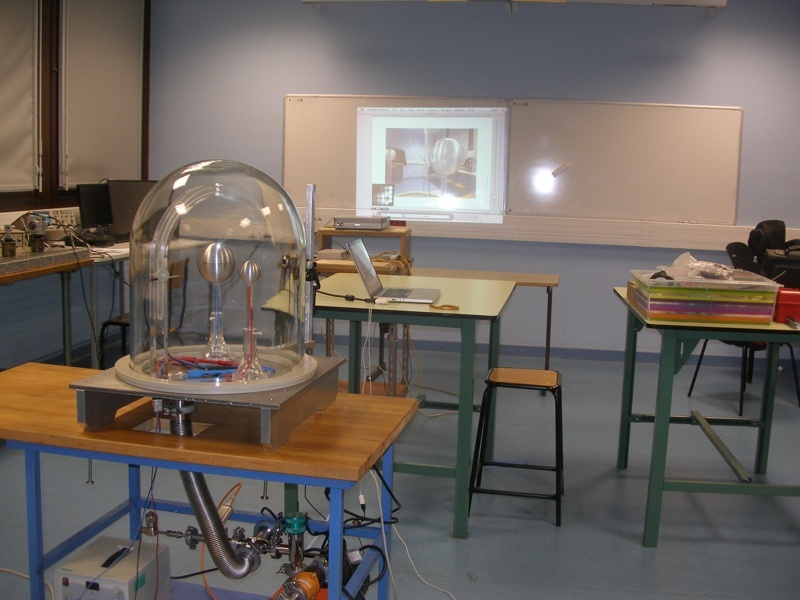 The company Verre Equipements (3, Rue des Quatre Chemins, 69660 Collonges au Mont d’or, France) achieved the feat of making the vacuum glass chamber for less than 800 euros in 2011. References on the plate allow making measurements. A new passage in the plate allows to connect a gas bottle, and so to multiply the colors of the aurora by sending other chemical species. But the most dramatic improvement is that now, the spheres can move! The technical difficulty is that putting a motor inside the chamber, ie in the vacuum, would have greatly increased the cost of experiment. So we found a trick that allows any movement without additional cost. But shhh ... I’m not saying how!